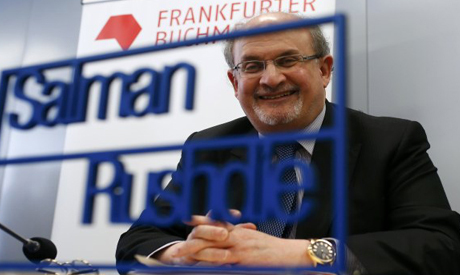 All attempts to curb free speech are "an attack on human nature", British-Indian writer Salman Rushdie said Tuesday at the start of the world's biggest book fair in Frankfurt. "Limiting freedom of expression is not just censorship, it is also an assault on human nature," Rushdie told a news conference. "Expression of speech is fundamental to all human beings. We are language animals, we are story-telling animals," he said, insisting that free speech was a universal principle. "Without that freedom of expression, all other freedoms fail," he said. Rushdie has had an Islamic death sentence hanging over his head for a quarter of a century over his 1989 book "The Satanic Verses". Iran's then supreme leader Ayatollah Ruhollah Khomeini issued a fatwa saying the author should be killed, forcing Rushdie to go into hiding, with the British government placed him under police protection. The decision to invite him to speak at the Frankfurt Book Fair, which opens later on Tuesday, sparked a boycott by Iran of the exhibition. "I always thought in a way we shouldn't need to discuss anymore about freedom of speech in the West, it should be like the air we breathe," Rushdie said. "It seemed to me that this battle was won a couple of hundred years ago" during the French Enlightenment, he said. "But the fact that we have to go on fighting this battle is the result of a number of regrettable, more recent phenomena," he continued, pointing to "violent threats" against writers, publishers, book sellers and translators. In addition, "in certain parts of the world, a new feeling of political correctness is also dangerous," Rushdie argued. His new novel, entitled "Two Years, Eight Months and Twenty-Eight Nights", is appearing almost simultaneously in English and in German translation. Last week, Tehran said it was boycotting the Frankfurt fair because it had, "under the pretext of freedom of expression, invited a person who is hated in the Islamic world and created the opportunity for Salman Rushdie... to make a speech." The author also said publishing was the "embodiment" and "guardian of freedom of speech". "If you believe in a single vision of the truth and you seek to impose that single vision of the truth on others, then people offering diverse visions of the truth become your enemies." "But yet oddly, literature often survives this battle," he said. "Literature is unbelievably durable and strong (though) writers are weak." The fair's organisers defended their decision to invite Rushdie, saying freedom of expression was a key theme at this year's gathering of writers and publishers, 10 months after Islamists marched into the Paris office of French satirical weekly Charlie Hebdo and gunned down 12 members of its editorial team. "Freedom of the word is not negotiable," said Juergen Boos, director of the exhibition. "The Frankfurt Book Fair is a place of dialogue," he said, adding that he regretted Iran's decision to stay away. "It mustn't be forgotten that Rushdie is still facing a death threat because of his work." The guest country of this year's show is Indonesia -- the nation with the world's largest Muslim population. About 70 writers from the Southeast Asian nation will attend, including author Laksmi Pamuntjak who will present her latest book "The Question of Red", a love story set at in the 1960s, a period of violent repression against communists. The Frankfurt fair dates as far back as the Middle Ages with the invention of the Gutenberg press just down the road, and this year some 7,300 exhibitors will be present, with up to 300,000 visitors expected. Internationally renowned writers will be promoting their latest works, including Ken Follett, who is set to speak about the video game adaptation of his runaway success "Pillars of the Earth". Chilean writer Isabel Allende, Denmark's Jussi Adler-Olsen and British anthropologist Nigel Barley are also among the attendees. The show will be an occasion for the struggling book publishing industry -- with an estimated total value of 114 billion euros ($129 billion) worldwide -- to look for new ideas as younger generations turn their eyes increasingly online.